Special functions, natural generalizations of the elementary functions, have been studied for centuries. The greatest mathematicians, among them Euler, Gauss, Legendre, Eisenstein, Riemann, and Ramanujan, have laid the foundations for this beautiful and useful area of mathematics. 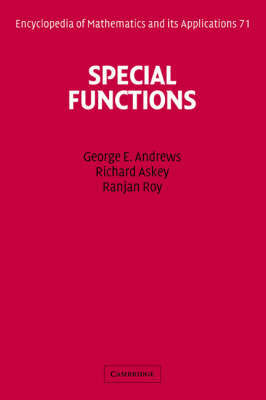 This treatise presents an overview of special functions, focusing primarily on hypergeometric functions and the associated hypergeometric series, including Bessel functions and classical orthogonal polynomials, using the basic building block of the gamma function. In addition to relatively new work on gamma and beta functions, such as Selberg's multidimensional integrals, many important but relatively unknown nineteenth century results are included. Other topics include q-extensions of beta integrals and of hypergeometric series, Bailey chains, spherical harmonics, and applications to combinatorial problems. The authors provide organizing ideas, motivation, and historical background for the study and application of some important special functions. This clearly expressed and readable work can serve as a learning tool and lasting reference for students and researchers in special functions, mathematical physics, differential equations, mathematical computing, number theory, and combinatorics.